Clearly and interestingly written, humorous and varied, requiring only a minimal familiarity with maths, The hidden mathematics of sport is a pure pleasure to read. It contains an impressive array of mathematical topics, much broader and more unusual than standard findings about the statistics of sports or the equations governing the motion of projectiles. In addition, this book is filled with neat sports facts and puzzles. Mindful of Stephen Hawking's maxim that "every equation halves the readership of a book," the authors decided to banish equations to the appendix, but even there they are kept to a minimum. This is a new edition of a book originally published in 2005, but there are several new sections, all chapters now come with a puzzle, and all the examples have been brought up to date. The book is organised in seventeen short chapters dealing with a remarkable variety of subjects. The first five chapters discuss the imperfections of the Olympic system, and how countries can exploit them to maximise their medal count; penalty kicks in football from the perspective of game theory (with actual practical conclusions); the ways the judging in ball games is affected by the umpires' position and movement; an analysis of tennis from a probabilistic point of view (which points are most crucial and exactly how important a good serve is); and league tables: what ways to score wins, losses and draws have been tried, their comparative strengths and weaknesses. After these five chapters many readers will think they know where this book is going to settle: probability and statistics in sports. They will be quickly proven wrong, however, because the next topic is the shape of various types of sports balls: the arrangement of patches in a football, a tennis ball, a baseball, etcetera. The mystery of why a football is not a platonic polyhedron will finally be revealed here. Following this, the authors move on to record breaking and whether or not it can go on indefinitely, as well as offering some insights on running, high jump and shot put. Probabilities reappear in dealing with the influence of the coin toss in sports. Indeed, the subjects do not seem to follow any particular order. After the coin toss come the intricacies of the dartboard design and its ramifications for the strategy of playing darts, and right after that billiards. Chapter 11 is appropriately titled Eleven and deals with the apparent importance of odd numbers, and in particular the number eleven, in sports. It covers the widespread obsession with stats as well as the abundance of team sports with an odd number of players in a team. It even touches on the belief about lucky and unlucky numbers. The authors probably had a tough choice: to run this chapter as 11th or 13th. As it stands, chapter 12 is dedicated to chances of scoring in football (not very high), and chapter 13 is entitled The Percentage Game – a comparison of careful calculation and risky gambling in sports. And gambling here can mean both actual gambling and making decisions during a game. No book about sports can be complete, unfortunately, if it does not mention cheating, and the present book is no exception. Cheating is covered in chapter 16, immediately after two chapters about scoring systems, tournament schemes and subjective judging. Finally, the last chapter is suitably concerned with the game endings, looking at games that can run forever (tennis), the effect of extra-time options (golden goals and silver goals in football), and whether the order of kicks in a shootout in football matters. As is clear from the subjects mentioned above, this book is a pell-mell assortment of loosely connected bits. You can start reading it from any page, but you will find it difficult to close this book until it is finished. It will make a fantastic read for the broadest possible audience. For a taster of the book read Rob Eastaway and John Haigh's latest Plus article The maths of gold medals: Four olympic thoughts. Ilia Rushkin is a Postdoctoral Research Fellow at the University of Nottingham. His research is in theoretical physics. If you like sport and have an interest in the statistics that seem to be produced for pretty much every major event and league then you can't really go wrong with this book. 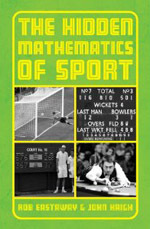 I personally have little interest in most sports, but I do have a mathematical background and that was enough to make the book enjoyable, so you don't necessarily need an interest in both sport and maths. The maths is dealt with in a straightforward manner for non-experts but an appendix gives more details if you want to understand more about the results that are given in the main body of the book. This is probably one of those slightly geeky books that won't appeal to everyone, but if maths and sport are your cup of tea to some extent then you will probably find something interesting here.